Pronuclear (PN) injection of the clustered regularly interspaced short palindromic repeats (CRISPR) and CRISPR-associated protein-9 nuclease (CRISPR/Cas9) system is a highly efficient method for producing genetically engineered golden Syrian hamsters. Herein, we describe the detailed PN injection protocol for the production of gene knockout hamsters with the CRISPR/Cas9 system. Li, R., Miao, J., Fan, Z., Song, S., Kong, I. k., Wang, Y., Wang, Z. Production of Genetically Engineered Golden Syrian Hamsters by Pronuclear Injection of the CRISPR/Cas9 Complex. J. Vis. Exp. (131), e56263, doi:10.3791/56263 (2018). The pronuclear (PN) injection technique was first established in mice to introduce foreign genetic materials into the pronuclei of one-cell stage embryos. The introduced genetic material may integrate into the embryonic genome and generate transgenic animals with foreign genetic information following transfer of the injected embryos to foster mothers. Following the success in mice, PN injection has been applied successfully in many other animal species. Recently, PN injection has been successfully employed to introduce reagents with gene-modifying activities, such as the CRISPR/Cas9 system, to achieve site-specific genetic modifications in several laboratory and farm animal species. In addition to mastering the special set of microinjection skills to produce genetically modified animals by PN injection, researchers must understand the reproduction physiology and behavior of the target species, because each species presents unique challenges. For example, golden Syrian hamster embryos have unique handling requirements in vitro such that PN injection techniques were not possible in this species until recent breakthroughs by our group. With our species-modified PN injection protocol, we have succeeded in producing several gene knockout (KO) and knockin (KI) hamsters, which have been used successfully to model human diseases. Here we describe the PN injection procedure for delivering the CRISPR/Cas9 complex to the zygotes of the hamster, the embryo handling conditions, embryo transfer procedures, and husbandry required to produce genetically modified hamsters. The golden Syrian hamster (Mesocricetus auratus) is one of the most widely used rodents for biomedical research. According to the U.S. Department of Agriculture, approximately 100,000 hamsters were used in the United States in 2015, representing 13% of total laboratory animal usage among the species covered by the Animal Welfare Act (http://www.aphis.usda.gov; accessed March 10, 2017). The hamster offers several advantages over other rodents in the study of a number of human diseases. For example, the histopathology of N-nitrosobis(2-oxopropyl)amine (BOP) induced pancreatic ductal adenocarcinomas in hamster is similar to human pancreatic tumors, while BOP treatment mainly induces thyroid gland tumors in rats and lung and liver tumors in mice1. Because hamsters are the only small rodent found to support the replication of adenoviruses, they are also the model of choice for testing adenovirus-based oncolytic vectors and anti-adenovirus drugs2,3,4. Another example wherein the hamster model offers an advantage over mice and rats is in the study of hyperlipidemia. Humans and hamsters exhibit great similarities in lipid metabolic pathways and both species carry the gene encoding cholesteryl ester transfer protein (CETP), which plays a central role in lipid metabolisms, while CETP is absent in mice and rats5. Additionally, hamsters develop hemorrhagic disease more representative of the human manifestation following exposure to Ebola virus6. Hamsters are also the models of choice for studying atherosclerosis7, oral carcinomas8, and inflammatory myopathies9. Recently, it has also been demonstrated that hamsters are highly susceptible to Andes virus infection and develop hantavirus pulmonary syndrome-like disease, providing the only rodent model of Andes virus infection10. To address the unmet need for novel genetic animal models to study the human diseases where no reliable small rodent model is available, we recently have succeeded in applying the CRISPR/Cas9 system to the hamster and have produced several lines of genetically engineered hamsters11. Hamster zygotes are highly sensitive to environmental milieus such that the PN injection protocols developed in other species are unsuitable. Therefore, we developed a PN injection protocol for the hamster that accommodates the special requirements for handling hamster embryos in vitro. Here, we describe the detailed PN injection procedure using the CRISPR/Cas9 system and the accompanying steps, from the preparation of single guide RNA (sgRNA) to the transfer of injected embryos into recipient females. The procedures described in this protocol were approved by the Institutional Animal Care and Use Committee (IACUC) of Utah State University (IACUC protocol: 2484). Hamsters used in this protocol are adult (6 - 10 weeks of age) LVG strain golden Syrian hamsters. All hamsters are housed in the vivarium at the Bioinnovation center, Utah State University. Room temperature is set at 23 °C, humidity is set at 40 - 50%, and light cycle is set 14L:10D (light:dark). Whenever possible, embryo manipulation and surugical procedures should be performed with sterile techniques. Synthesize sgRNAs following the in vitro transcription procedures described in the manual of synthesis kit (Materials Table, Supplement 1). To assemble ribonucleoproteins, mix 2 µg of Cas9 with 1 µg of sgRNA and incubate the mix at room temperature for 10 - 15 min. For PN injection, make a working solution at the concentration of 100 ng/µL Cas9 and 50 ng/µL sgRNA with 10 mM TE buffer (RNase free, Materials Table). NOTE: Vasectomy is performed on male hamsters at 6 - 8 weeks of age. The surgery should be performed 10-14 days ahead of the first mating. Sterility is confirmed by failed pregnancies from mating with fertile females. Vasectomized males can normally be used for a year before they become less sexually active. Anesthetize males by intraperitoneal (i.p.) injection of ketamine/xylazine with a dose of 40 mg/kg (ketamine) and 10 mg/kg (xylazine). Confirm anesthesia by lack of a pedal reflex (toe pinch). Lay the sedated hamster in dorsal recumbency on a dry tissue paper. Rinse the abdomen with three rounds of antiseptic treatments by alternating surgical scrub solutions between 70% alcohol and povidone-iodine. Make a vertical incision with surgical scissors starting 1.5 cm cranial to the prepuce extending 1 cm to each side from mid line (Figure 1a). Incise the skin, subcutaneous tissue, and linea alba to access the peritoneal space (Figure 1b). Apply gentle pressure to the caudal aspect of the scrotum to force the testes and fat tissue out. Grasp the vas deferens gently with forceps and carefully separate the blood vessel from the vas with a second set of forceps (Figure 1c). Hold the vas deferens with forceps to form a loop. Heat the tip of another forceps in flame until it is red, and then use it to remove the loop of the vas deferens. Insert fat tissue and testes back to abdomen. Remove the vas deferens on the opposing side with the same procedures. Suture the musculature first followed by suturing the skin. Place the animal on a warm pad in a cage for 30 min until the animal recovers. Observe the animal until it resumes normal activity. Monitor and record estrous cycles. NOTE: Female hamsters have a stable 4-days estrous cycle that is maintained immediately after parturition. Females on the first day of estrous can be identified by the opaque, yellowish and sticky vaginal discharge (Figure 2a). Females on Day 4 of estrous can be identified by the transparent, sticky mucus (Figure 2b). For superovulation of donor hamster, superovulate the sexually mature females (>6 weeks) on the first day of the estrous cycle by IP injection of pregnant mare's serum gonadotropin (PMSG; dissolved in PBS as 50 IU/mL) (Table 1) between 9 - 12 AM. NOTE: PMSG is for inducing superovulation but not for estrous cycle synchronization. 80 - 84 h after injection of PMSG (Day 4, 6 - 8 PM), place the females in cages with males for mating. As hamster matings do not result in copulation plugs, ensure successful matings by watching the matings. Prepare pseudopregnant females by mating sexually mature females on Day 4 of estrous with vasectomized males. The time schedule for preparing donor and recipient females are shown in Table 2. NOTE: True pregnant females can also be used as recipients, i.e., females with a coat color distinguishable from the golden color matted with the same color fertile males. Pups derived from embryo transfer can be identified based on coat colors. A potential advantage in using true pregnant females is that endogenously produced embryos would ensure successful pregnancies and help PN injected embryos to implant; a potential drawback in using true pregnant females as recipients is that PN injected embryos need to compete with endogenously produced embryos for implantation. Prepare culture medium (HECM-9; recipe is described in Supplement 2), as described previously in McKiernan and Bavister12. One day prior to PN injection, prepare zygote handling dishes (25 µL/drop) and a PN injection drop (100 µL) in the lid of a 35 mm dish with HECM-9. Then cover the medium drops with mineral oil. Balance medium in an incubator overnight under the following conditions: 37.5 °C, 10% CO2, 5% O2, 85% N2 and 100% humidity. On the day scheduled for PN injection, prepare embryo flushing dishes (1 dish/donor hamster) with HECM-9 and store all dishes in the incubator until use. Euthanize superovulated hamsters with CO2. Place a euthanized female hamster in dorsal recumbency on a surgical drape or tissue paper and prepare the abdomen with a 70% ethanol spray. Firmly hold skin and abdominal muscle layer at the midline and make an incision. Incise the peritoneum to expose the abdominal organs. Grasp one of the uterine horns with a fine forceps and retract the tissue from the abdomen. Separate the uterus from the mesometrium and fat tissue. Make a cut between the oviduct and ovary and a second cut adjacent to the junction of the oviduct and uterus (include a small part of uterus). Place the two oviducts in the same flush dish. Under the dissection microscope, grasp the side of uterine horn with a #5 Dumont forceps and insert a homemade needle (Figure 3) into the lumen of the oviduct from the infundibular end and flush the oviduct with 300 - 400 µL of HECM-9 medium. Collect the zygotes immediately and wash them twice with HECM-9 medium in the handling dish. At this stage of development, all of the zygotes should be denuded from cumulus cells. Place the zygotes in an incubator (37.5 °C, 10% CO2, 5% O2, 85% N2 and 100% humidity) immediately after collection to minimize exposure to light . Thaw the Cas9/sgRNA RNP on ice and maintain the complex on ice during the entire PN injection process. Load the injection needles with Cas9/sgRNA RNP solution immediately before the injection experiments. Place the rear end of the injection needles into the tube containing the Cas9/sgRNA RNP solution and allow the Cas9/sgRNA RNP solution to fill the needle by capillary action. Prepare the injection dish and needles. Fill the holder pipette with mineral oil to within ~3 mm of the bend of the holder needle. 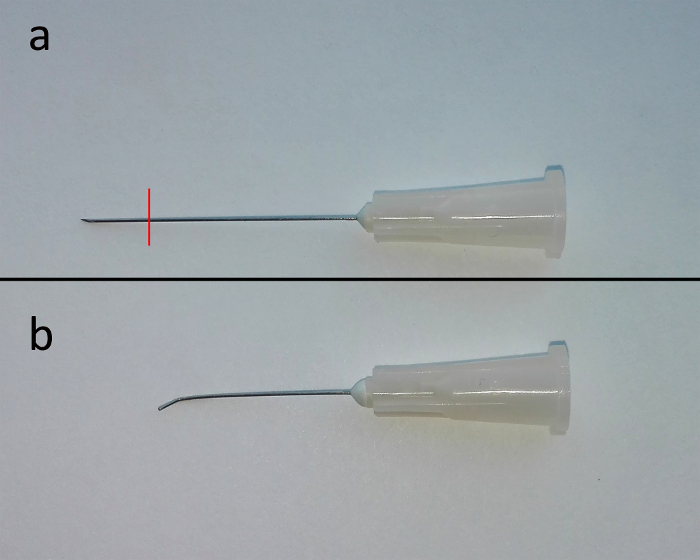 Place the holder in the microinjector with the tip of the needle horizontal to the bottom of the dish and fill the tip of the needle with medium by suction. Set the injection needle at a 10 - 15° angle opposite to holder. Identify a zygote and apply a fine suction with the holder needle. Ideally, the male and female pronuclei are within the same focal range and aligned parallel to holder. Penetrate the zona and male pronuclei (3 o'clock position) with the injection needle. Withdraw the injection needle quickly once the pronucleus swells to prevent the nucleus from adhering to the needle and to avoid damaging the pronucleus. 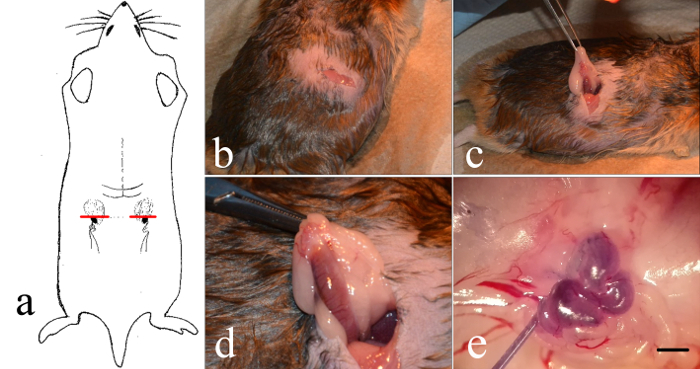 Anesthetize a pseudopregnant hamster (the same way as described in the vasectomy section above) and lay it on a surgical drape or dry tissue paper in ventral recumbency. Apply eye lubricants to the eyes of the animal to prevent eye dryness and cover the head with a cloth or paper to protect the eyes from light. Prepare the lateral aspect of the body by shaving a about 4 cm x 4 cm skin area on each sides of the body followed by applying 3 times of povidone-iodine scrubs and 3 times 70% ethanol scrubs. Make a 2 cm vertical incision 2 cm caudal to the last rib (as shown in Figures 4a, 4b) on each side of the back of the animal. Grasp the fat pad with forceps and pull gently until the oviduct and uterus are visible. Clamp the fat pad with a hemostats and reflect the fat pad dorsally over the spine (Figure 4c). Position the reproductive tract such that the uterine tube can be penetrated with a 30 gauge needle for embryo transfer (Figure 4d). Wash the injected zygotes with HECM-9 in a new dish. Use a new glass pipette (diameter: ~150 - 200 µm) to load 10 - 15 zygotes. Arrange the zygotes as a chain of pearls followed by several air bubbles. Insert the pipette into the open penetrated tube from step 6.3 and gently blow into the pipette to transfer the zygotes to the oviduct. Continue blowing until the first air bubble is released into the oviduct tract (Figure 4e). Release the fat pad and return the tissue to the abdomen. Transfer approximately the same number (10 - 15) of injected embryos to another oviduct tract by the same processes. Suture the musculature and the skin in 2 layers. Administer Buprenorphine-HCL ( 0.5 mg/kg) subcutaneously as post-op analgesia. Return the hamster to a cage and place the cage on a warm pad for recovery. Return the cage to the animal room when the animal is fully recovered from anesthesia. Post-op analgesics are given again six hours later. The efficiency of the described protocol in producing genetically modified hamsters depends on the outcomes of the following two critical steps: the live birth rate of recipient females and the number of live pups with the intended genetic modifications. The live birth rate is a direct results of the embryo quality and the skill of the individual performing the PN injection and embryo transfer procedures. To ensure that the developmental potential of manipulated embryos is not compromised, great care is necessary during the in vitro handling of the hamster embryos. We regularly achieve a live birth rate of 60 - 80% with pseudopregnant recipient females. Table 3 illustrates live birth rates from the RAG1 knockout experiment (pseudopregnant females were used) and the STAT2 knockout experiment (true pregnant black females were used; live birth rate in this case was calculated as the percentage of litters produced golden pups). The percentage of genetically modified pups produced from PN injected embryos depends on both the efficiency of sgRNA in introducing indels and the successful injection of the Cas9/sgRNA ribonucleoproteins into the pronuclei. We found that sgRNA efficiency varies among gene targets (unpublished observations). As shown in Table 3, the sgRNA designed for STAT2 resulted in a gene targeting efficiency of 88.9%, while the sgRNA for RAG1 was only 28.6% efficient. 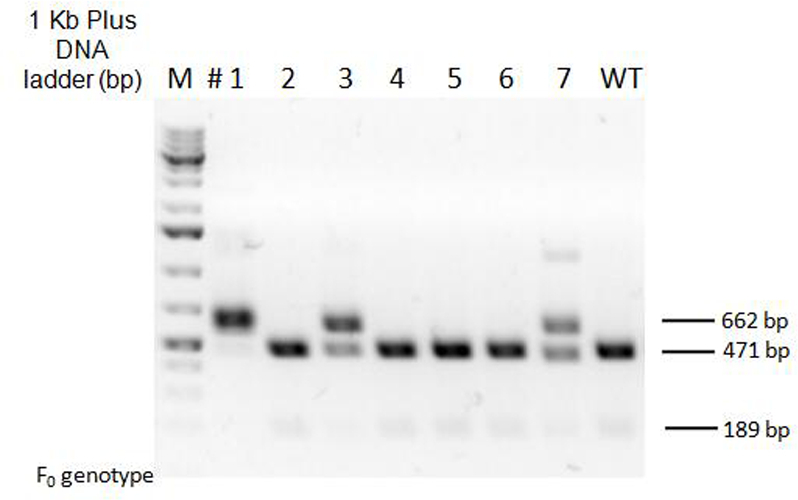 Figure 5 provides an example of the genotyping results from a PCR restriction fragment length polymorphism (PCR-RFLP) assay of pups from RAG1 gene targeting. It is important to note that some indels may occur outside of the restriction enzyme recognition sequence, such that PCR-RFLP may underestimate the gene targeting efficiency. Subcloning the PCR products into TA cloning vectors followed by Sanger sequencing of the PCR inserts are necessary to accurately measure gene targeting efficiency and to reveal the nature of indels. Figure 1: Male Hamster Vasectomy. a) and b) Make a 2 cm vertical incision beginning 1.5 cm cranial to the prepuce extending cranially; c) Separate the vas deference from the associated testicular vein and artery with two pairs of forceps; d) Grasp the vas deferens with a forceps to form a 1 cm loop. Heat a second set of forceps and excise the loop while cauterizing the ends concurrently. Please click here to view a larger version of this figure. a) The vaginal discharge observed on Day 1 is opaque, yellowish, and sticky b) The vaginal discharge observable on Day 4 is clear and sticky. Please click here to view a larger version of this figure. Figure 3: Preparation of the Needle for Embryo Isolation. a) Fracture a 30 gauge needle along the red line and polish the tip until it is flat and smooth. b) make a 30 - 40° angle at ~3 mm from the tip. Please click here to view a larger version of this figure. a) and b) Make a 2 cm long vertical incision starting 2 cm caudal to the last rib (red line); c) Clamp the fat pad with a Hemostats and reflect the tissue dorsally; d) Adjust the position of oviduct tract and penetrate an open with a 30 gauge needle; e) Arrange the zygotes as a chain of pearls within the embryo transfer glass pipette and transfer them into the oviduct from the penetrated open. Bar=1,000 µm. Please click here to view a larger version of this figure. Figure 5. PCR-RFLP Assay of a Single Litter of Founder Animals with RAG1 Indels. M: 1 Kb Plus ladder. WT: wild type. ID 1, 3 and 7 show uncut band consistent with RAG1 indels. Please click here to view a larger version of this figure. * females matted with fertile males were used; the number of litters indicated is only those produced golden pups. Supplement 1: Synthesize sgRNA by GeneArt Precision Synthesis Kit. Please click here to download this file. Supplement 2: Hamster Embryo culture Medium-9 (HECM-9) recipe. Please click here to download this file. To better exploit the potential of golden Syrian hamsters as models of human disease, we developed a PN injection protocol for delivering a CRISPR/Cas9 complex to target the hamster genome. The PN injection protocol optimizes several key variables including the embryo culture medium, temperature, and wavelengths of light13. There are also several hamster-specific animal handling procedures that need to follow for successfully conducting gene targeting in the hamster. For example, sexually matured female hamsters have stable 4-day estrous cycles that cannot be synchronized with exogenous hormones (e.g. PMSG). Thus accurately tracking the estrous cycles of each female is important for both superovulation and pseudopregnancy preparation. 30 - 60 zygotes can be produced from a female if she is successfully superovulated. To achieve successful superovulation, it is necessary to consider species-specific deposition of fat. 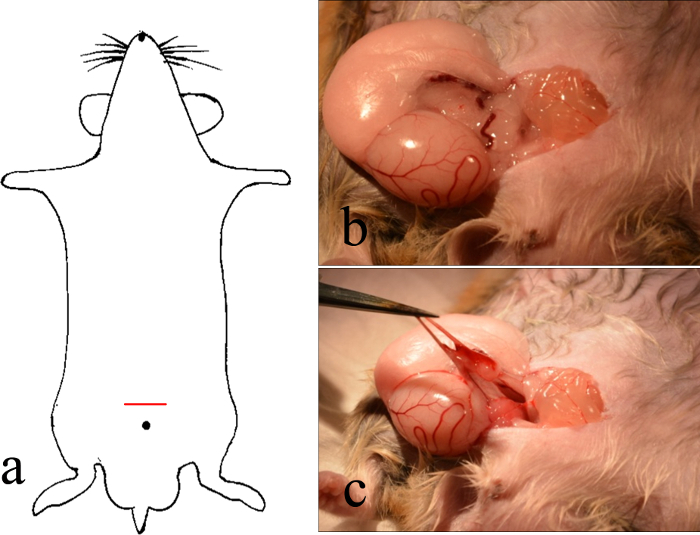 Female hamsters, especially those over 12 weeks of age, tend to have excessive abdominal fat such that the syringe needle must be positioned correctly to fully penetrate the fat pad when performing hormone injections. We have found that penetration half-way into the peritoneal cavity achieves the appropriate distance for hormone delivery. We summarized the unique requirements for PN injection, hamster handling and husbandry in Table 4. For PN injection, the number of embryos transferred to the injection dish for each round of injection must be determined experimentally to avoid extended injection time. The longer the time the embryos remain in the dish, the greater the chance that they experience overexposure to light. We recommend transferring approximately 15 embryos to the injection dish for each round of injections. This number achieves a good balance between the number of rounds of injections and the tolerable exposure of the embryos to light. As both of the cytoplasmic and pronuclear membranes of hamster embryos are quite flexible, substantial force must be applied to the injection needle to penetrate the membrane of the pronucleus. During this time, the pronuclei must remain within the focal range. ZW has financial interests in Auratus Bio, LLC., a biotechnology company specialized in creating genetically engineered animals for biomedical research and agricultural applications. Research reported in this publication was supported by the National Institutes of Allergy and Infectious Diseases (NIAID) of the National Institutes of Health under award number 1R41OD021979 (to ZW) and by a research grant from the Next-Generation BioGreen 21 Program, Republic of Korea, grant no. PJ01107704 (to ZW) and grant no. PJ01107703 (to IK). The content is solely the responsibility of the authors and does not necessarily represent the official views of the National Institutes of Health or BioGreen 21. We thank Dr. Nikolas Robl for editing the manuscript. Takahashi, M., Hori, M., Mutoh, M., Wakabayashi, K., Nakagama, H. Experimental animal models of pancreatic carcinogenesis for prevention studies and their relevance to human disease. Cancers (Basel). 3, (1), 582-602 (2011). Wold, W. S., Toth, K. Chapter three--Syrian hamster as an animal model to study oncolytic adenoviruses and to evaluate the efficacy of antiviral compounds. Adv Cancer Res. 69-92 (2012). Thomas, M. A., et al. Syrian hamster as a permissive immunocompetent animal model for the study of oncolytic adenovirus vectors. Cancer Res. 66, (3), 1270-1276 (2006). Thomas, M. A., Spencer, J. F., Wold, W. S. Use of the Syrian hamster as an animal model for oncolytic adenovirus vectors. Methods Mol Med. 169-183 (2007). Hogarth, C. A., Roy, A., Ebert, D. L. Genomic evidence for the absence of a functional cholesteryl ester transfer protein gene in mice and rats. Comp Biochem Physiol B Biochem Mol Biol. 135, (2), 219-229 (2003). Ebihara, H., et al. A Syrian golden hamster model recapitulating ebola hemorrhagic fever. J Infect Dis. 207, (2), 306-318 (2013). Jove, M., et al. Lipidomic and metabolomic analyses reveal potential plasma biomarkers of early atheromatous plaque formation in hamsters. Cardiovasc Res. 97, (4), 642-652 (2013). Vairaktaris, E., et al. The hamster model of sequential oral oncogenesis. Oral Oncol. 44, (4), 315-324 (2008). Paciello, O., et al. Syrian hamster infected with Leishmania infantum: a new experimental model for inflammatory myopathies. Muscle Nerve. 41, (3), 355-361 (2010). Safronetz, D., Ebihara, H., Feldmann, H., Hooper, J. W. The Syrian hamster model of hantavirus pulmonary syndrome. Antiviral Res. 95, (3), 282-292 (2012). Fan, Z., et al. Efficient gene targeting in golden Syrian hamsters by the CRISPR/Cas9 system. PLoS One. 9, (10), e109755 (2014). McKiernan, S. H., Bavister, B. D. Culture of one-cell hamster embryos with water soluble vitamins: pantothenate stimulates blastocyst production. Hum Reprod. 15, (1), 157-164 (2000). Takenaka, M., Horiuchi, T., Yanagimachi, R. Effects of light on development of mammalian zygotes. Proc Natl Acad Sci U S A. 104, (36), 14289-14293 (2007).